Hanover, Md. — McLaren Engineering Group announced the completion of its design work on the new 350,000-square-foot Live! Hotel and Event Center in Hanover, Md. The building has 310 hotel rooms, a spa, and 1,500-seat ballroom. The hotel will employ over 500, serving tourists, residents and Live! Casino patrons in the Baltimore region. The grand event center and conference center are to follow, later this year. McLaren and its team of expert engineers have been working on the project for more than five years to design a cost-effective structural frame without sacrificing key architectural elements and flexibility. The firm provided services that include structural design & engineering, construction documents, permitting, site / civil engineering, survey work and site landscaping. 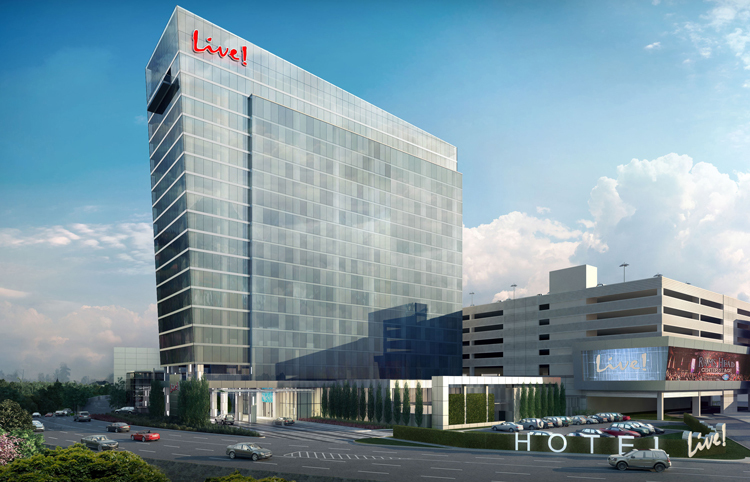 Owned by The Cordish Companies, the hotel was built as an expansion to the Live! Casino structure that opened in 2012. Live! Casino is the largest casino and entertainment venue on the East Coast with approximately 4,000 slot machines and more than 200 live action table games. The two million-square-foot structure includes approximately 310,000 square-feet of casino space on the first level. The hotel’s construction was phased to minimize interruption to the 24-hour casino operations. McLaren moved an existing roadway adjacent to the west side of the casino about 300 feet to create space for the new hotel. The new surface parking lots will provide in excess of 1,900 spaces and are built on top of ground that previously housed a stormwater pond. The building pad underwent extensive ground improvements to solidify the soil before construction could begin. An existing stormwater pond was transformed into 4,600 linear feet of 10-foot-diameter pipe underground. The hotel tower is the tallest structure in Anne Arundel County, Md. For more information, visit: https://www.marylandlivecasino.com/hotel-spa/live-hotel.